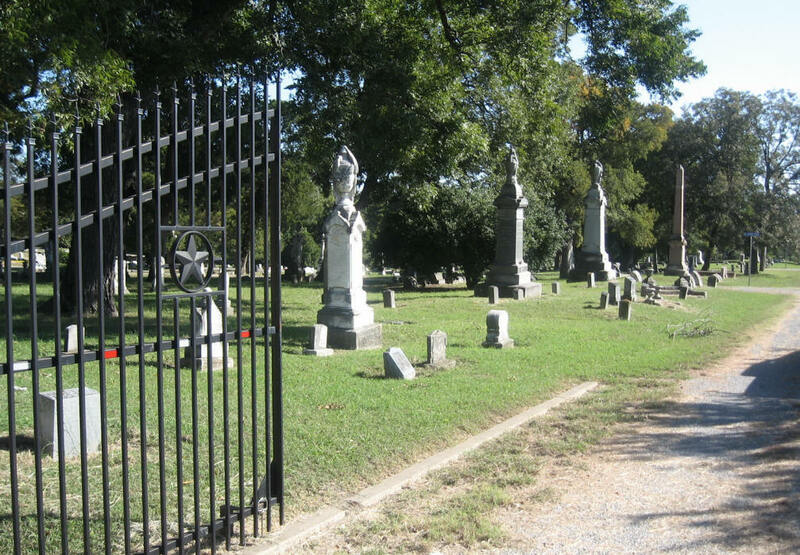 This cemetery was started in 1870 by I. D. Newsome, Isaac Graves, Thomas J. Brown, G. A. Foote, and E. R. Stiff. The cemetery was surveyed and platted by George White. It is a private cemetery and does not belong to the city of McKinney. Many early residents, besides the trustees, are buried here. Among them are Governor Throckmorton, Elder R. C. Horn, Senator J. R. Gough, and surveyor George White. The original deed for the cemetery was for 21 acres and is listed in Vol S, p 427. Additional land has been bought since then. A cemetery association was started in 1889. Memorial Day is celebrated every year in May. This is a very large, fenced cemetery with over 2000 graves. It has many impressive markers, several over 10 feet tall. There is a stone entrance on McDonald Street and openings in the fence on Industrial Blvd. The stones and grounds are in excellent condition. There has been some vandalism here, but repairs are usually swift. The cemetery has a fulltime sexton. The sexton's office should have a list of all of the veterans of the Mexican Wars, War of 1812, and the Civil War buried here. The SAR chapter in Plano is currently getting military markers for the veterans buried here. 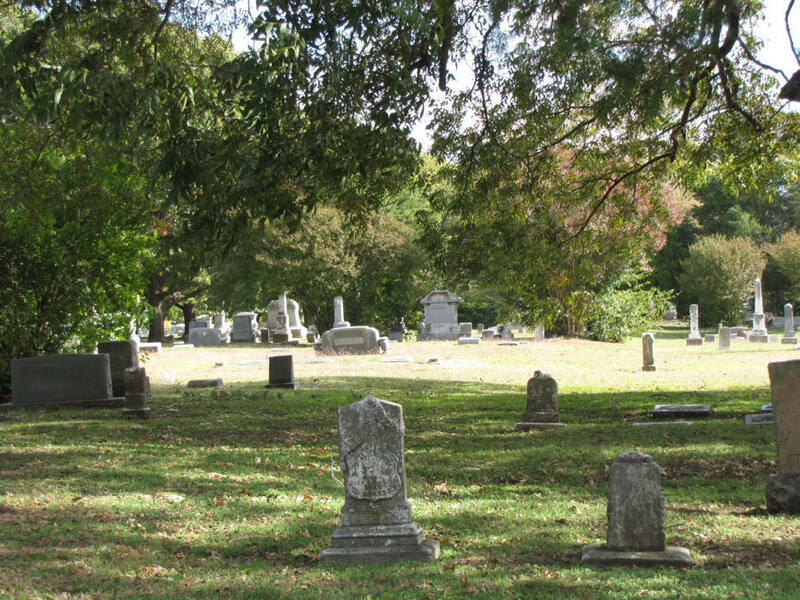 This cemetery has been the main cemetery for McKinney since 1870. It is still active. There is a Potters' Field Cemetery on the south that is actually a part of this cemetery. The Ross Colored Cemetery, which has a separate charter, is on the southeast. There are a few graves in the cemetery that predate 1870. These graves were probably moved here from other cemeteries. The cemetery has a historical marker. We give thee up, arise in the light. Thine unveiled fame to Truth, Thy soul to God. THIS AREA WAS BEGUN BY A PIONEER FROM TENNESSEE, DR.
WILLIAM E. THROCKMORTON (1795-1843), AND HIS FAMILY. 21.3-ACRE TRACT BY ISAAC F. GRAVES, I. D. NEWSOME, G. A. LAND WAS PURCHASED IN 1892 AND 1960. PECAN GROVE DECORATION DAY IS HELD EVERY SPRING. A plot of the cemetery was prepared by George White, father of Mrs. W. T. Hoard of this city, dividing said land into blocks, lots, walks and drives, providing for 84 blocks and 500 lots, each lot 20' by 30.' It was stipulated that blocks 71, 72, 73, 74, 79, 80, 81, and 82 (48 lots) were to be used for the burial of white persons, evidently such persons as were not financially able to purchase a lot, and blocks 69,70, 75, 76, 77, 78, 83, and 84 (48 lots) for the burial of black persons and freedman. Certain lots were set aside for the promoters, as follows: Thomas J. Brown, lot 1 in Block 23; G. A. Foote, lot 1 in Block 28; Isaac Graves, lots 2 and 3 in Block 21; and I. D. Newsome, lot 4 in Block 24. The remaining 399 lots were to be sold at $90 each, the proceeds therefrom to be used in repaying the sum of $260 to the promoters for purchase price of the land; the erection of a fence around the grounds, and the maintenance thereof, and any remaining amount to be used in establishing an endowment fund, the interest therefrom to be used in the keeping of the grounds. On August 8, 1889, J. P. Nenney, John Church, H. C. Herndon, B. W. Rhine, and J. H. Jenkins, other early Collin County settlers, voluntarily associated themselves together for the creation and organization of a private corporation under and by virtue of the General Incorporation laws of the State of Texas, and upon submitting the necessary articles of corporation to the Secretary of State, a charter was issued to them on August 10, 1889. In the articles of corporation it is stated that the number of Directors of the corporation shall be five, and that the incorporators as named above shall constitute the first year. So far, I have been unable to obtain further information until the year 1892, and it is assumed that the directors as above named carried on without the naming of other officers in the interim. A second tract of land adjoining the original purchase on the east, 42.40 acres, was purchased by J. H. Jenkins, acting as agent for the corporation, on February 12, 1892, at a price of $1,272.00. This transaction is recorded in the office of the County Clerk, Book 53, pages 296 - 298, on February 25, 1892. On April 27, 1907, persons holding lots in the cemetery, met at the Elks Hall in McKinney, and by a majority vote of those present determined to incorporate under the name and style of McKinney Pecan Grove Cemetery, and passed a resolution to that effect. Evidently they were not aware of the fact at the time that a charter had been previously obtained, and there appears to be no record of a second charter being issued. At the meeting in question the following directors were named for the first year: Mrs. Jennie M. Walton, Mrs. Jean Rhea Emerson, Mrs. Mattie E. Wylie, Mrs. Rachel C. Heard, Mr. J. L. White, Mr. J. R. Gough, and Mr. J. L. Doggett. Mrs. Jean Rhea Emerson is the only survivor of this group. It was further voted at said meeting that the Directors prepare suitable By-Laws for Government of said corporation, and when done Mr. Thomas J. Brown, the only survivor of the original group of incorporators at the time, transfer of all property to the association in deed dated June 12, 1907. If By-Laws were ever adopted no trace of the original or copy could be found at this time. I was also unable to determine if officers, other than directors, were elected at the meeting held April 27, 1907, or just when the first president and Secretary were elected. However, an old minute book was finally located, which covers a period from June 29, 1907, to October 23, 1944, and it would appear from record of the first meeting that Mrs. S. H. Abbott was the first president. "The Cemetery Association had a very pleasant meeting with Mrs. Wiley (Mrs. T. W. Wiley) June 29. Mrs. S. H. Abbott resigned as President and Mrs. E. A. Newsome was duly elected to fill the chair. Mrs. Pardue resigned as Treasurer and Mrs. Henry Warden was elected to fill her place. Dues received Mrs. W. P. Polley $1.20. The ladies discussed the lawn mower which had recently been purchased and they were favorably impressed with same. There being no further business the Association adjourned to meet July 27. Mrs. W. C. Robinson, Secy." Mrs. Lula (W. C.) Robinson, recent President of the Association, and Mrs. Henry Warden are the only survivors of those mentioned in the minutes as quoted. Throughout a greater part of the time covered by the old minute book the Association held monthly meetings, and was one of if not the most important gathering of the women of the time. The reading of this now historic record by the present "old-timers" would bring to mind many pleasant memories of bygone days, and no doubt would inspire us not only to carry on but to enlarge upon the work started and kept alive by the many good women long gone to their reward. In the early days of the association, as recorded in the old minute book, funds needed for the upkeep of our cemetery were raised by giving dinners, holding bazaars, sponsoring base-ball and other games and amusements. These affairs were usually held in December of each year, and on an occasion in December, 1911, more than 100 ladies are named as being on various committees. Mrs. Sarah Howell holds the record for the longest period as President of the association, having served continuously from June, continuously from June 6, 1908, until her death, July 13, 1938, a little more than 30 years. Others serving as President, as shown by the old minute book were Mesdames S. H. Abbott, E. A. Newsome, and Lula (W. C.) Robinson. Mrs. T. W. Wiley probably served longest as vice-president. Henry and Ona Warden no doubt gave more of their time and effort than any one else in carrying on the work of the association.